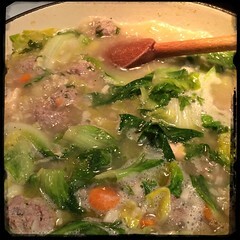 Chicken Soup with Escarole and beef meatballs is commonly known as ‘Italian Wedding Soup.’ While it’s a holiday staple for many Italian-American families we’ve found it’s great all-year long especially during the flu season. During the holidays this soup is was served during the Primo course after the Antipasto, before the pasta and the Secondo course in which the meats are served. We never called this “Wedding soup” which is a misread translation of the Italian “Minestra Maritata,” which literally means “married soup.” The reference to “married soup” refers to the use of both chicken and beef which are ‘married’ together with the escarole. Minestra Maritata recipe is traditionally served by families in the south-west of Italy such as Napoli during Christmas, this makes perfect sense since my grandmother had learned some of her cooking style from her mother-in-law who was from Napoli. 1 1/2 lbs. of chicken (2 chicken breasts), cut up. garlic, crushed and minced or pressed through a garlic-press. 1. Prepare the meatball mixture but do not form the meatballs until you’re ready to drop them into the soup. 2. Heat 3 tbsp olive oil in a large soup pot or dutch oven. Sauté the chopped onions, minced garlic and hot pepper flakes. 3. Once the onions are translucent, toss in the chicken and cook for about 5-minutes or until the chicken is cooked. 4. Once chicken is cooked, toss in carrots and celery, mix well and cook for about 5-10 minutes, mix frequently. 5. Add the white wine and wait until it comes to a boil before adding 1 cup of water. You should also toss in 2 or 3 bay leaves. 6. Add 1 cup of chicken stock, wait until it begins to boil and then continue adding your liquid alternating between water (3-4 more cups) and chicken stock (3 cups more). Remember, add one cup at a time and allow the soup to come to a boil before adding any more liquid!. 7. Once you are finished adding the liquid you can add the freshly squeezed lemon juice, salt and pepper (to taste) and let the soup come to a boil once more. 8. Once the soup is boiling you can toss in the uncooked meatballs, try to keep the meatballs small. 9. You can add the pre-cooked rice and the fold in the escarole. Let cook for 10 minutes or so before serving. As a side note, you do not need to add the rice at this point, you can omit the rice in the cooking stage and add later while serving! 10. Serve topped with grated Pecorino Romano or Parmesan cheese.